Cindy came over on Saturday and we put beer and chocolate in waffles. And if that wasn’t enough, we s’more-ifyed them. 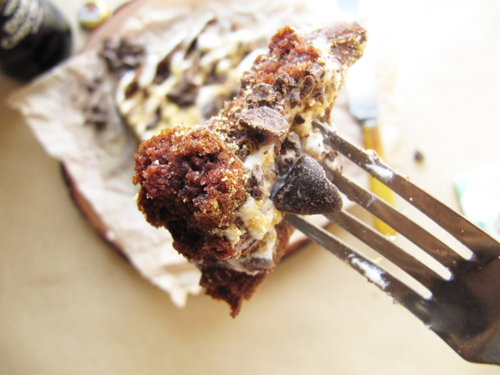 We topped them with marshmallow sauce, graham cracker crumbs, and more chocolate. These are light and tasty! They are my second favorite to the Belgian-style yeast waffles. And these guys are low-maintence! The batter doesn’t need to rest at all. It’s never tired. I already have plans to make these guys again and top them with ice cream, because honestly, I daydream about THIS all the time. 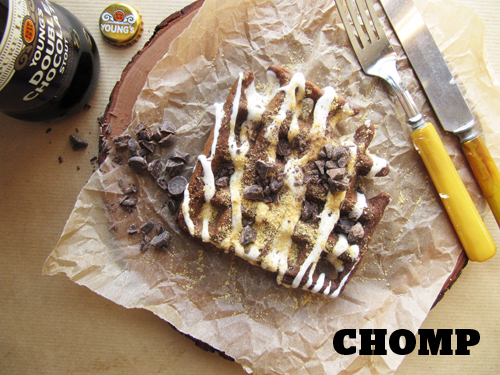 For the recipe for these Chocolate Stout Waffle S’mores head over to Cindy’s post right HERE! P.S. Take A Megabite was nominated for a Homie Award on The Kitchn! (Can you even believe it?!) If you’d like to vote for me click HERE. 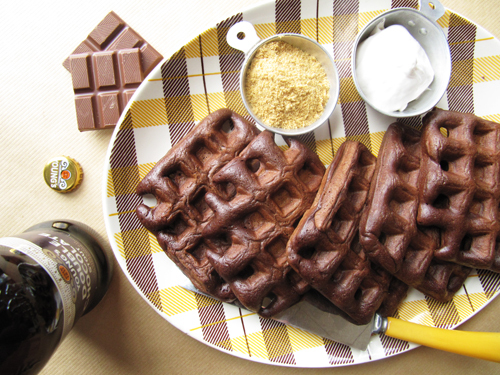 these would be the best for those waffle-ice-cream sandwiches! Yes! I think we need to ice cream it up Dairy Dan style next time we hang out. I voted! Your blog is awesome. And we could have puppy b-day parties for Elliot and Biscuit. I just voted! I hope you win, because you totally deserve it!!!! I wish we were neighbors for real! Puppy parties would be so fun! And both Elliot and Biscuit do that adorable head-tilt thing. It’d be too much cute for one party! Yes! Can’t have too much of a good thing, right? Holy jesus, these look amazing. I must get a waffle iron. I’m voting for you, homie! P.S: Now I really want a beer. Yeah man, waffle irons are life-changing! P.S. I always want a beer! Awww yeah these are legit! Conrats on the nomination, I’ll vote for you! Ooh a waffle pillow would be the best pillow. Thanks, Maya!